After several attempts to pull this bugger; I've finally resigned to the fact that we may have to ask a professional to rid us of this unsightly tooth. Initially, it was funny that Everett could push it perpendicular to his gums. He thinks it's hilarious to grit his teeth and nearly (but unsucessfully) pop the tooth out. I gag everytime I look at him and that can't be good for his self-esteem. After one week of "look at this, Mom," I think I might hog tie him and knock him in the mouth with a hammer pluck it out. This is his first time to lose a tooth; he was shown up by his baby sister (who swallowed her first tooth, then popped the other out this summer in the pool--no pulling needed). Right now he has four loose teeth, I don't think I can bear it...gag. My kids and I just returned from a week long trip to visit my sisters (we flew on skybus and I would suggest if you can swing it to use them, I got $20 tickets!). I arrived home to a message from my aunt requesting an update on my blog. She's frantic about a phone call she heard about from my grandma who heard about it from my mom who heard about it from me. Why do I bother blogging when the grapevine works so well? To appease my aunt, who is probably my most diligent reader, I will have to update on this mysterious phone call. 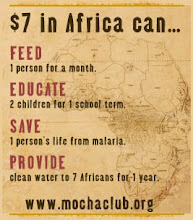 First, I want to post links to two families' blogs who are in Ethiopia right now picking up their babies. The pictures are fabulous and the video is great and I soooo wish that Seth and I were there with them picking up our kids, but first we need a referral! Go check out the Carpenter's and the David's journeys! I was at the library and couldn't answer my cell phone. When I checked the message it was a Virginia number and my heart jumped. Then I thought, "Nah, calm down it's probably nothing." So I called Duni back, but she was gone. Her message stated that she had a quick question for me. I was kicking myself for not getting the phone; and wondering what "quick question" meant. That wouldn't be what she said if she had our referral, right? When she finally called back I was in the van with the kids (plus extra baby). Before I answered I told the kids to "SHUSH, This could be important about the babies!!!" (say that fast, loud, and filled with drama and you will get the idea). Evidently, that worked because they sat silently listening to my end of the conversation--no arm flapping for silence needed. "Apryl, I got a call from Ethiopia yesterday. We know you requested a boy under 12 months and a girl under 3 years old. They were wondering if you would be open to adopting a 4 year old girl." "Of course," Me, dumbfounded, cannot speak, cannot even think straight. "Okay, great, have a nice day." I grunt a reply and hang up. Pretty eloquent. Pretty thrilling. Then I sat and nearly cried. I don't know why I almost cried, maybe because I'm a dufus or maybe because one day in the near future I'm going to hear the names and ages of my children. This is finally happening, folks! We are inching along, but this is progress. Sort of. When Seth finally returned my frantic call, he shot questions at me left and right. And I had no answers, because, well, see above conversation. By the time I spoke to him I had determined that Duni was calling just in case--you know, hypothetical. Then I got to my sister's house. Imagine the torment there--two sisters plus my mom--"Well, what did that mean? You need to call her back. She won't care." They drove me crazy until I emailed Duni about the call. She emailed back saying, "In reference to your question; yes, we do have potential children but please know that there is a lot of process taking place behind the scenes before we can refer children. We are required by law to have all the medical and social history of a child before we inform prospective adoptive parents. All I can tell you and your family is to rest assured that we are actively processing your case. But as for time frame…we are working to have you complete the adoption and travel by early spring." Now, I'm pretty pumped about that response. I won't hold her to the "travel by early spring" part, but just to know something would be great. I'm trying to be patient, carrying the cell phone with me always, possibly peeing my pants everytime it rings. To all you who call me on that phone--stop. Call my house, leave a message--retro, but I assure you that it will work. And I'll have a few less gray hairs. "What's the difference between God and a doctor?" "God knows He's not a doctor." This is the joke that a friend told me after I relayed our experience with the neurologist this week. I knew it was bad from the second he walked into the examining room. He brushed past Seth without a glance. Made eye contact with me (then looked away without saying anything) and proceeded to station himself in front of Ella's file and read. For five minutes. I've never experienced that before, ever. My parents taught me to greet someone upon meeting them for the first time. I am teaching my kids that--firm handshake, look at their face, and respond in a polite way, "Hi, how are you today?" We have even role played. Evidently, this doctor wasn't taught properly or lost all the practical lessons upon graduation of medical school. It's a shame. His momma is probably proud of his accomplishments but ashamed that his people skills are so lacking. He's probably a good doctor, but I couldn't like him. I really tried. After asking a few questions about Ella's "episodes" he said, "Well, let's start her on this medication. It's relatively new. Has caused lethal rashes in some cases, but if we are careful with doses that won't be a problem. I'll write the script." Whoa, wait a second! Might we discuss this, would you care to go into detail about the rashes? The LETHAL rashes? Are there other meds we could talk about? Oh, but you are typing on your little computer and ignoring us again. Hmmm. I interrupted his typing and started asking questions. I'm like that. Perturbing. The doctor showed his irritation by answering my questions in you-are-an-idiot fashion. Evidently I am an idiot, because I still had to come home and do some "research" on the internet. What did I find? My daughter is having absence seizures, and she has epilepsy. Will she grow out of this? No one knows. She's taking a little white pill that could cause a rash (but unlikely) that will be evidence of deeper, darker things going on in her body. Hopefully, the little white pill (which will evolve into 12 little white pills by March) will help her brain to stop shooting random electrical impulses during "math" class with Mommy. This diagnosis also gives us hope that Ella doesn't have ADHD, but instead is having so many seizures that she loses track of what she was saying/doing. My mom mentioned what a blessing it is for us to still be waiting for our Ethiopian kiddos. We've been a little hectic lately and it's nice to get Ella "taken care of" before we go to Ethiopia. My mom is such an optimist, and in this case I will agree. It's nice to get things on the homefront settled before we launch ourselves into chaos. After I wrote that last post, I looked at the ticker (I should remove that so I can get rid of some stress). People, do you see that thing? Do you see that in 2 days it will be one week shy of EIGHT months?! Is this driving anyone else CRAZY? I feel a smidge better now. But only a smidge. I'd like to be expecting a phone call from America World. I don't want to get my hopes up only to have them dashed. Last night a missionary spoke at church and read this verse. Funny how that goes, I've read through Psalms and that has never jumped out at me (or it would already be underlined). But it sure struck me last night. God does wonderful works--how do I know, what is the proof? I've seen them. I have experienced them in my life, the wonderful works that he does. I've been in situations that cry out of God's provision. Isn't that enough? Shouldn't I be able to look back over the times that He has provided, that he has proven His love for me? It sure should be enough. But God does more--His thoughts are on me. And my kids. Lately, I've been thinking about our kids that aren't with us. I pray for them throughout the day, but I guard myself against spending too much time thinking about them because it breaks my heart. I feel so sad for them that it's crippling. Since I can't see where they are, it doesn't help for me to be upset. Right now they may be with their first parents, happy and healthy. And I want them to stay there for as long as possible. Isn't it grand to know that God knows where they are and His thoughts are on them? Last week, Everett broke down crying before bed. I thought he was missing our family, or sad coming home after the holidays. He finally sputtered out that he misses our kids that aren't here. Our house feels lonely. Eli is asking me at least twice a day about his 'brother and sister'. He prays for them to come home soon; even asking for prayer for them in Sunday School class. Seeing his big brother in tears probably didn't help the situation any. So what could I say? I sat down on the floor next to their beds and told them the story of getting Ella. They had heard the abbreviated version before. But they had not heard about the mix-ups, the lost paperwork, and us being mistaken for another American couple. Then I explained that the family who wanted to adopt Ella ended up changing their minds, because the mommy who was told she would never have a baby, found out that she was going to have a baby. I went on to say that it is hard, and confusing but God has two kids picked out for our family and they just aren't ready yet. That brings me back to the verse--the very last line give me a lump in my throat. "Thy thoughts which are to us-ward...they are more than can be numbered." Last week my nagging feeling finally gave way to action and I pulled out my copy of the beloved dossier. As I stood over sizzling pans and cooked dinner, I poured over the dates on each document. Much to my chagrin, our medicals and police clearances were done last March. Our homestudy was dated April 17. So much for being on the ball and getting everything done in a "timely manner." This is the one time in my life that being efficient may have a backlash. I never would have thought last year that we would still be waiting to bring home our kids, ummm, I mean, hear anything of our kids. Before I freaked out I asked our new family coordinator at America World what this would mean for re-doing stuff. Then I held my breath. She said that it varied state-to-state. Huh? Doesn't Ethiopia care that my paperwork is old? I was meticulous with dates while paperchasing for Ukraine, it was stressed to us many, many times to be careful about the dates on documents because you might end up doing it all over again before you travel. I'm still in that mind-set, I guess. So I didn't believe our family coordinator when she said our homestudy date doesn't matter to Ethiopia. Asking for clarification she explained that our states implement the standards for homestudies so we have to find out the specific requirements for the state. Another family is dealing with the same terror, and she called her social worker. She found out that not only would she have to update her homestudy, but the supporting documents (clearances and medicals) would need to be updated also. Shudder. Really big Shudder. I left a message with my social worker the next day. Expecting to hear that we should start everything again, that we need to schedule doctor's appointments, fingerprinting, and a visit to USCIS...she surprised me. She left a beautiful message for me on my answering machine. "Your homestudy is good for 2 years." Huh? So I called her, to clarify. Also, these days, good news like that needs to be heard a few times. She jubilantly told me that, Yes, our homestudy is good for two years. Though our fingerprints will need to be updated in June for USCIS, everything else is good for a while. Hanging up the phone, I did a happy dance and twirled with the nearest kiddo. What great news! We won't need to update things, until June. Screeching to a halt, "June? Are we still going to be waiting in June?" I wrote this a while ago, but couldn't post because, well, it would ruin the surprise! This is unrelated to adoption, my kids, or my family. Today I did something that I've never done before in my life. I accomplished a feat I never thought I'd do. And I actually have spent time thinking about doing it, but never thought myself capable of the task. I made a dress. Yep, there you have it folks, I ACTUALLY MADE SOMETHING WORTHY OF WEARING. What could possibly warrant me taking on something so momentous? Calm down, folks, we didn't get a referral, my dear friend is having a sweet baby girl. Since this is her fourth child, and since she's standing on the precipice of 40--I thought she might deserve something extra special. Not that nearing 40 and having a fourth child (and doing so quite gracefully, if I do say so myself) isn't special enough! I set out last night to start on this creation and I can't believe it, but I actually finished this cutie-patootie dress and a matching blanket. Though I have sewed before; I have NEVER, EVER put a zipper on anything. For a half-a-second I thought about plugging in the hot glue gun, but I took a deep breath and attached the zipper foot to the machine (after calling my mom to ask what a zipper foot is). Will I do this again? Oh dear, I don't know. I think, IF we get referred a baby girl that I could pass the time waiting for travel by sewing her sweet nothings to wear. Do I think that likely to happen? Not really, because I'll be running around like a chicken with her head cut off. And chickens are not well known for their sewing skills, especially when missing their heads. For a few weeks (excluding Christmas break) I've been helping a friend by watching her youngest, a 7 month old chubster. He has got to be the easiest baby I've ever met. For those of you who don't know what "easy" means--in my book an easy baby does two things. They can hang out while I make lunch or dinner and they go to sleep on their own. Today, I watched the chubby little guy and his two older sibs, a 2 year old and 6 year old. I don't know how to explain what the day was like; but I'll say that I hope my future isn't like what this day held. Thankfully, 2 year olds still take naps, even if they scream until they are red in the face and try to kick you. Their bodies are tired and little and will finally succomb to exhaustion before you do. Though I know my life with two more kids will be different than a day babysitting--this day exhausted me and I didn't even attempt schooling! I called Seth in the middle of the day and asked him who's big idea it was to adopt two kids at once. He laughed and reminded me that he wanted an older child and I pleaded for babies. Basically, no sympathy from him. I did get the opportunity to evaluate how my house IS NOT ready for a baby and toddler. Later in the afternoon I called Seth again to tell him that we need to move. We have entirely too many levels in our house and we definitely must get rid of the bunkbeds--they mean death for climbing toddlers. Again he laughed. Five years ago our youngest arrived so quickly that Seth and I hadn't quite figured out what to name him. After a quick post-birth discussion we decided to name him Elijah Judson. Now he's known as 'lij, 'lijah, 'lijabah, Elijah Judson (when in trouble) or just JUDSON (when in really big trouble), Burpmaster, and Heyyou. He is a mellow, easy to please little guy. Though he definitely has his moments of TOTAL and COMPLETE fury rage relentless passion during a wrestling match (we have had to call him off of adult men to keep THEM from being injured). Today he requested my famous cream of potato soup for his birthday supper, appropriately named "Divine Potato Soup" because, surely, potato soup in heaven will taste like this. Here is Eli enjoying a little bit of heaven. We are celebrating with our extended family at the end of the month, but we had to have cupcakes and ice cream on his actual birthday. Here's a blurry, but cute, picture of the birthday boy blowing out his candle. Eli is thrilled to be five, when he woke up this morning he said, "I'm as old as Ella now!" Much to her dismay. The first Christmas God sent a wonderful gift, His son Jesus Christ. He was sent to redeem a fallen world; and give peace to those who accept His sacrifice on the cross as a payment for their sins. We hope that you will enjoy true peace and joy this Chrismas by accepting this gift of God. Our family is expecting BIG news in the next few months. We should be receiving the details of the children we are adopting from Ethiopia. We are all very excited about the addition of two children to our family! 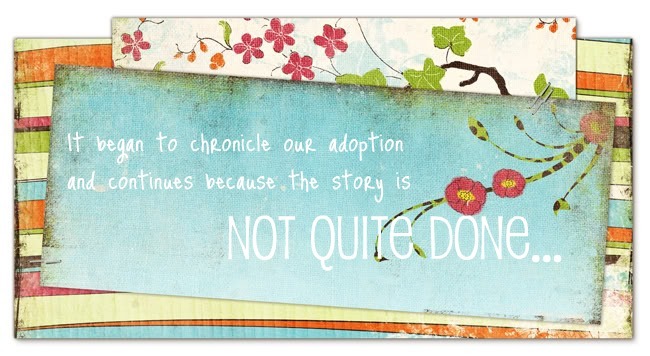 This Christmas season we hope that you, too, have been adopted.